My fiancée keeps telling me that too many cakes are not good for me, and I never listen: I always liked cakes! 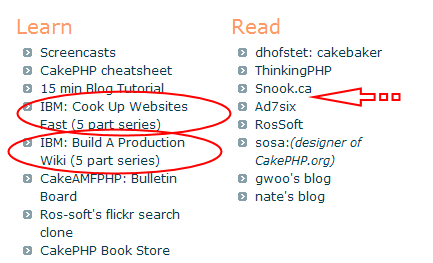 I did like the CakePHP™1 framework too, once, and I did write some articles about it in the past, and I believe at least a bunch of Bakers found them useful, especially at the time. I do believe the Cake™ Software Foundation1 quite liked having their framework featured on popular websites like php|architect and SitePoint, and I believe that I contributed – to some extent – to make it one of the most popular frameworks available for the PHP programming language. Unfortunately though someone decided that two of such articles and my personal website were no longer worth a mention on CakePHP official website frontpage. To me, this makes sense since the two CakePHP-related series which are being published by IBM are much more up-to-date than my articles, and thus deserve such a mention instead. Of course I can’t provide any proof that I took the screenshot yesterday, and of course I don’t have any proof of the fact that someone in CSF may have thought that due to my recent bad behavior my articles didn’t deserve to be publicized anymore. I am confident that the Cake Software Foundation always does its best in keeping its site up-to-date, and I am glad that yesterday’s accident reminded them that there were far better articles which needed to be featured on their site. At least I finally did something good for the community! Sarcasm apart, I feel I owe an apology for blowing this whole thing out of proportions: I disclosed embarassing details about our past project which – for the sake of the framework – should have never been made public, perhaps. I want all of you to know that I still think that CakePHP is the best PHP framework ever made and I genuinely think that Larry E. Master did outstanding work in all this time, along with the rest of CSF members and contributors. Best of luck for your future editorial and development projects. Since now my contributions are no longer “officially recognized”, I think I’d better to move on devoting my attention to something else. 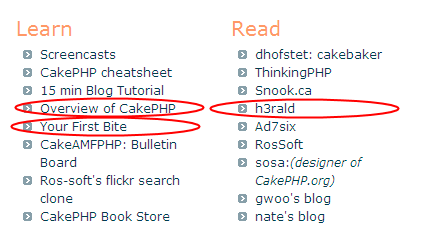 1 “CakePHP” and “Cake” seems to be registered trademarks of the Cake Software Foundation Inc. I’m not sure if I’m allowed to use them in this blog — If anyone has any problem with it, please let me know.